‘‘Emerging Dis/Order,’’ at Bates College Museum of Art . But of course, a line is singular, whereas life is bewilderingly plural. 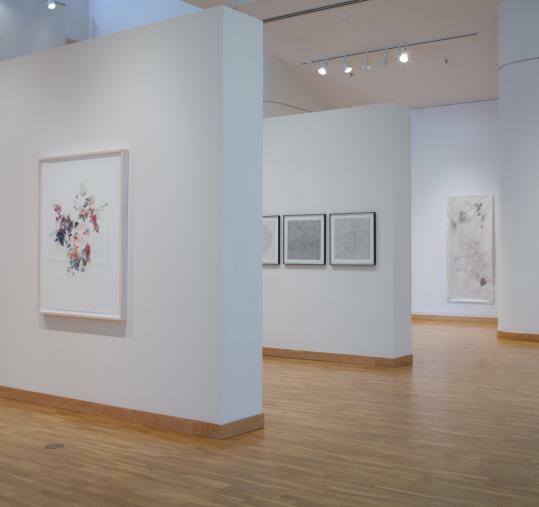 The three artists in “Emerging Dis/Order,’’ an excellent contemporary drawing show at the Bates College Museum of Art in Maine, remind us that lines are multidirectional. They swarm and multiply, and will not be kept on a leash. “Emerging Dis/Order’’ - an unfortunate title that all but screams “Fussy academics in charge!’’ - is, against the odds, an ambitious, approachable show well worth visiting. A better title might have been “Swarm Intelligence,’’ which one of the artists, Alison Hildreth, used for a series of paintings she worked on in 2005. It captures exactly the quality these three women have in common: a fascination with how forms multiply, divide, and coalesce again. Hildreth delights in exploiting drawing’s potential to go beyond mere visual description. Her works here, on large, vertically oriented stretches of crinkly rice paper, are packed with information in different registers - botanical, cartographic, and so on. The results are messy, at times, but deliberately so. Your eye keeps getting pulled back in, wanting both to read the information Hildreth conveys and to make her disparate forms cohere. Coherence is built into the conception of Amy Stacey Curtis’s work. Curtis is known in Maine for staging shows - she calls them solo biennials - in empty mills scattered throughout the state, each installation exploring a different theme (“experience,’’ “movement,’’ “change,’’ “sound,’’ and so on). The projects place a premium on viewer interaction (“without participants,’’ she had said, “my work is incomplete’’) and are marked by an interest in serial repetition and process. If all this smacks of cliché, the relief is that there’s a sharp intelligence behind Curtis’s work. Visually, it’s marvelous. Her work here is a series of drawings she calls “27 Hours.’’ It’s the latest in a body of work that hinges on time and process. Back in 2009, Curtis made a series of 27 drawings, on the first of which she spent one minute, on the second two, the third three, and so on, up until the final drawing which took exactly 27 minutes to complete. The drawings here are more developed. She spent one hour on the first of them, two on the second, and so on, up until the last, a 27-hour feat of endurance, packed with visual detail and impressive finish. The drawings are abstract, although they have a pleasingly organic feel: One might be studying magnifications of spreading bacteria or blood cells. Curtis favors circular and ovoid shapes, and has a tremendous feeling for subtleties of light and shade, which she controls through soft but precise accumulations of charcoal. Her shapes and marks swarm and swell, obeying indecipherable rules. Andrea Sulzer, the third and edgiest artist here, also works with abstract forms. But where Curtis achieves an organic, almost decorative unity, favoring symmetry and all-over compositions, Sulzer embraces fragmentation, disruption, and imbalance. Her works, however, are no less beautiful for that - partly because she uses high-keyed colors and a range of improvised marks that suggest something of Pierre Bonnard’s skittish intensity. Sulzer’s work suggests the influence of the Analytic Cubism of Picasso and Georges Braque, but she releases herself from their compositional discipline. Her triangular and rectilinear shapes read like a patchwork of ambiguous planes that hint at spatial recession even as they sit stubbornly on the surface. Sulzer leaves great areas of space empty, and allows others to be muddied or smudged, leaving a ragtag impression that nicely tempers her almost too-sweet coloration. One untitled work here is huge - in stark contrast to the intimate scale of the others. Specially commissioned for the show (which is part of the 2011 Maine Drawing Project), it’s a knockout, proving that a fiddly, ad hoc idiom can be transposed to a work of daunting scale. You just have to know what you’re doing.